When you think of a trading computer, you probably imagine a wall of monitors. I remember when I first started as a broker, guys used to stop by my office just to gawk at the two gigantic monitors I had on my desk. Having two monitors was a big deal for traders back then. Nowadays, anyone can easily have four, six, or eight monitors. Once you have a multiple-monitor trading computer, what do you do with it? How do the most productive traders organize their trading tools to take advantage of all those monitors? Most trading software platforms give you two options for using multiple monitors. Option 1 is to dedicate each monitor to one work area, sometimes called a work surface. Alternatively, option 2 is to spread your work surface across all your monitors. Personally, I don’t like organizing my trading software this second way. I know some do. If you want to try the second option, but you’re not sure how, here’s an earlier post I wrote showing the steps for extending your desktop across multiple monitors. If you’ve decided to go with option 1, there’s still the question of what to show on which monitor. If you aren’t careful, you could end up with a jumbled-up mess. Here are my suggestions. My favorite way to organize my multi-monitor trading computer is to give each monitor a job. Here’s an example. Let’s assume you have four LED screens. Monitor #1 would be your main trading area, displaying 5-minute charts. Monitor #2 would be used for viewing daily and weekly charts. Monitor #3 would be used for viewing closed trades and P/L for the day. Monitor #4 would be used for your web browser or email. As you can see, every monitor has specific job. Once you get used to your personal scheme, you never have to waste time searching for a particular chart. You know exactly which monitor to go to for research, and it won’t be covering up a window displaying an open trade. If you want to be a successful trader, you must be able to react to new information and market changes instantly. Any time you struggle to remember where a specific software window is located, or any time you have to click more than once to take an action, you may miss an opportunity to take a profit. Maximize your chances for success by always opening your daily charts, live trades, research, etc. in the same monitor positions at the start of each trading day . This way, you’ll take advantage of muscle memory and will always know exactly where everything is located across your multiple monitors. When deciding what software to open on which monitor, pay attention to priorities. Most importantly, dedicate one of the monitors closest to you to the software you look at most. Pick whichever monitor your eyes fall on naturally. For me, the window I show on my primary monitor is my open, active trades. On the other hand, the software I look at the least I relegate to my upper two monitors. For example, if I am monitoring market indexes, I don’t need to look at those every minute. But, if a specific stock changes directions unexpectedly, I want to be able to glance up and see if the market as a whole is turning over. Another example of prioritizing your multiple monitors is email. I don’t want my email software client to be right in my face. Otherwise I’m getting distracted by my inbox and incoming emails. So I put the email window off in a small corner where it won’t distract me. Many trading software platforms allow you to save preferences. Not only will they let you save indicators and chart time intervals, they will also save the layouts that you’ve organized. In fact, you may find it helpful to use more than one layout across a single trading day. In the morning, before the open, you may want a research-based layout for your trading software. Once the market opens, you may want a layout dedicated to live trading. By having preferences defined and named for these two layouts, you will save valuable time at the opening when it’s time to switch between the two. 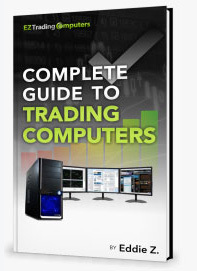 If you already have your trading software organized for maximum productivity, congratulations! If not, now is a good time to think about the efficiency of your multi-monitor trading computer in terms of helping you to get things done. Get your monitors and windows organized as I have outlined. Then train your brain and muscles to know where everything is located. Have everything be one click away. That’s the rule! And in the future, as needs and software come and go, keep your multi-monitor trading computer windows well organized, so your trading day will unfold as smoothly and profitably as possible.